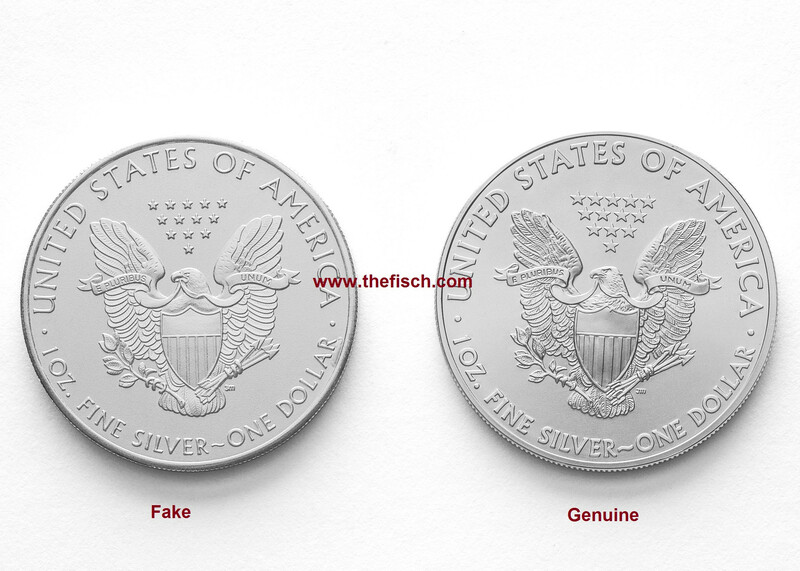 Fisch News: Fake American Eagle silver coins surface - Dont buy fake gold coins. Get the Fisch. Protect your gold investment. A counterfeit 2011 American Eagle silver bullion coin recently passed as genuine at a coin shop in Toronto contains no silver, but does contain a trace amount of gold in its composition. Andrew Greenham from Forest City Coins in London, Ontario, Canada, obtained the counterfeit from a second Toronto dealer who had acquired 10 examples from yet a third, unidentified, Toronto dealer, who was duped into purchasing the pieces from an unidentified seller, as genuine silver Eagles. It is unknown how many counterfeit 2011 silver American Eagles were passed as genuine and whether fake silver American Eagles bearing other dates are also in the marketplace. U.S. Mint spokesman Michael White said Jan. 26 that Mint officials were unaware of the counterfeits. White said he forwarded to the U.S. Secret Service information provided by Coin World about the counterfeits. The Secret Service confirmed being contacted by the Mint. On Jan. 26, Greenham posted on the Numismatic Guaranty Corp. Collectors Society online forum (boards.collectors-society.com) images and some details about the counterfeit. He posted the information he had obtained in order to educate others about the existence of the counterfeits in the marketplace. Greenham subsequently had the counterfeit subjected to spectrographic analysis Jan. 29 and provided Coin World with a copy of the results. According to the University of Chicago website at UChicago.edu, spectrographic analysis is a noninvasive process where chemical elements are determined by measuring the wavelengths or spectral line intensity of a sample of matter. "Spectroscopes break down the light emitted or absorbed by chemical elements into specific lines of color," according to the website. "Every chemical element has a 'fingerprint' of its own that can be used to identify it." Greenham said officials at the unidentified facility where the spectrographic analysis was conducted suggest that “the gold is probably an anomaly, as it wouldn't make sense to put any of that in there." Comments posted by collectors and dealers on the NGC Collectors Society message board after Greenham posted his images of the counterfeit suggest the fake could fool the unsuspecting unless a detailed examination were made. Other collectors suggested the designs were crude, showing Liberty as having a Hobbit face, mannish, almost resembling Bilbo Baggins, the main character in the novel and movie The Hobbit. One St. Louis dealer indicated on the message board that his firm has seen similar counterfeits. "We've gotten nailed by similar fakes," the dealer posted. "The sellers will often take a roll of genuine coins and swap out a few in the middle. Thus, cursory inspection, or even quickly rifling through the 'roll' fails to reveal the fakes. We keep some fakes on-hand for employees to look at and learn what to watch out for." Said another: "Goofy obverse. They could easily be slipped into solid date rolls without many noticing. Not many people weigh each Eagle when they purchase, [especially] if you are buying more than 10. They could pass. That's the scary part. Lots of newbies buy Eagles for some reason or another. I could easily see people buying these, [because] they are good enough to be a threat." >Among the general differences, the weight of the counterfeit is 32.608 grams compared with the statutory weight of 31.101 grams for a genuine American Eagle silver bullion coin. >The fake is thicker than the genuine coin, by as much as 20 to 25 percent, but the diameter of the fake is slightly smaller than the standard 40.6 millimeters. > The die orientation of obverse to reverse on the counterfeit is medal turn, not coin turn. For a U.S. coin, when its obverse is right side up, turning the coin on its vertical axis will reveal an upside-down view of the reverse. In medal turn, which is what appears on the fake silver American Eagle, the obverse and reverse both face right side up at the same time. >Liberty's jawline on the counterfeit American Eagle silver bullion coin is more masculine, almost appearing bearded. >On the counterfeit American Eagle, the lettering is thinner and not as defined as on a genuine example. >The date digits are larger on the fake American Eagle and spaced farther apart. >The length of the first ray to the left of the sun is shorter on the fake silver American Eagle coin. >The top of the L in LIBERTY on the fake extends farther left of the third ray. >The E in LIBERTY on the counterfeit version is almost completely exposed, while on a genuine American Eagle silver bullion coin the bottom bar of the E is almost completely covered. >The lettering is thinner on the counterfeit; the tail of the U in UNITED is also longer. The tail was added to the genuine American Eagle design in 2008. >The stars above the eagle's head are slighter smaller and not as sharp in detail on the fake as on the genuine American Eagle silver bullion coin. >The eagle's beak on the fake American Eagle is larger than on the genuine coin, almost parrotlike in shape. >The feathers on the eagle's head and neck on the counterfeit coin are not clearly defined as they can be found on the genuine silver American Eagle. Why a silver bullion coin? 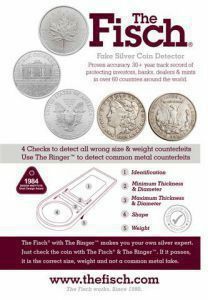 Why would anyone want to counterfeit an American Eagle silver bullion coin? "Money," Greenham said. "There are fake $2 coins here in Canada. Why bother faking a $2 coin? Because it's profitable." Greenham says he doesn't see enough American Eagle silver bullion coins in his coin transactions to have all of the fine details memorized. "Perhaps that's why they showed up in Canada, as we're all used to our Maple [Leaf], much more so than the American Eagle,"
Greenham said in his posting at the NGC website. "They [the counterfeits] were originally presented for sale to a Canadian dealer. I was told they were in capsules and then in 12 or 20 pocket pages. If the dealer was pretty busy or distracted in some way, he may not think about inspecting them closely. As I said, if the first sale was successful, the seller would then bring out some tubes. "For me, whatever I'm buying, I'm paying attention. I [believe] I would have stopped and compared with another Eagle, because of the strangeness of the look. But when you're busy and need to get to the next guy, ..." Greenham said.